I have been given an .slpk file generated by Drone2Map. I can import the .slpk file into ArcGIS Pro but I'm unable to edit the 3D layers in the package. I have not been able to find a way to extract the layer data from the .slpk file so that I can make it editable. Is there a way to do this? 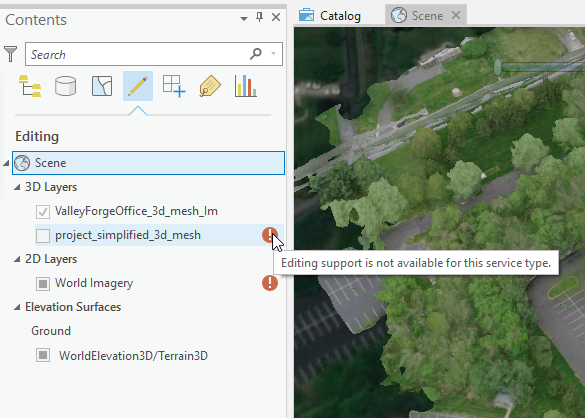 Browse other questions tagged arcgis-pro 3d 3d-analyst 3d-model scene-layer-package or ask your own question. How can I assign spatial information in ArcGIS Pro? How do I add a custom made north arrow to an ArcGIS Pro Project? Extracting data from vector tile package (.vtpk) using ArcGIS Pro? Extracting overlapping polygons using ArcGIS Pro?